Medical Administration will be a great area for you if you are the type person who wants to help people by providing care and some comfort level to people who have medical needs. So create your medical administration resume with that in mind. People who work in this field will generally have very good and friendly communication skills who are also great at multiple tasks. If you have some of these qualities then this might be the position for you. You enjoy helping many people. You are able to handle a lot of responsibilities. Good at listening to people and a great communicator. Organized and very detail oriented. Enjoy being friendly, very outgoing, and definitely caring. There are a lot of different job titles for this position like, Medical Office Assistant, another would be Medical Administrative Assistant, or perhaps a Patient Representative, and lets not forget Administrative Assistant. Medical Administration really covers a lot of different areas. If you will be working for a very small practice, it's likely that you're going to handle all the general administrative duties, like greeting the patients, and then scheduling their appointments, filing of their records, also purchasing any supplies and other equipment, and maintaining the waiting room in an orderly fashion. In larger hospitals, a medical office assistant will have a particular area of expertise they will take care of, an example would be admissions, or it could include insurance and also the billings and coding departments. 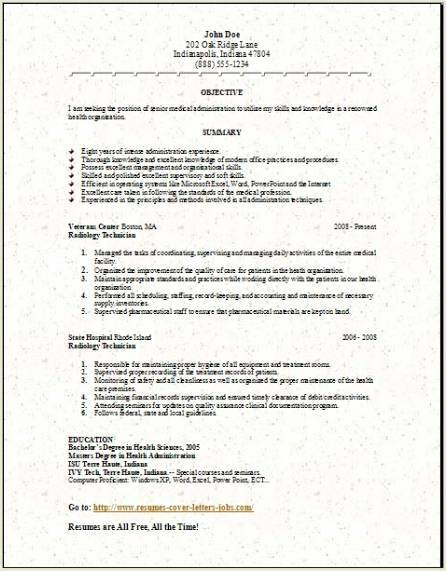 The 3 medical administration resume formats you see above are absolutely free to our visitors. 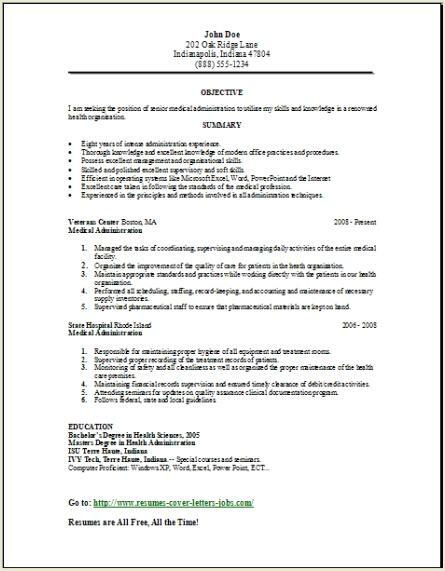 Backspacing to edit these resumes is very fast and very easy. All it takes is to enter your own information. This helps with getting your resume completed in record time. After you're done editing just compare the 3 options, choosing the one that you like best. We have tried to help keep it fast for you, somewhere around 30 to 60 minutes, and you are finished with your new medical administration resume. Most medical services managers’ titles will depend on each facility and the area of expertise they are working in. A nursing home administrator will manage all the staff, the admissions process, all finances of the unit, and overseeing the building maintenance. All states do require that they all be licensed; licensing will vary by each states requirements. Clinical managers will oversee a very specific department, for example nursing, or surgery, or possibly physical therapy, and will also then handle all responsibilities related to that specialty. Also clinical managers will create and set policies, procedures and goals for their particular department; they will also evaluate their staff’s work quality; and also develop reports and set any budgets for their department. The health and information managers will be responsible for the maintenance and very important security for all patients' records. They need to constantly become updated with the evolving patient information technology and any proposed or current laws about the health information system. Security is very important so a health information manager needs to make sure their databases are very accurate, complete and are only accessible to verified authorized personnel. If you are looking to be an assistant administrator, they will work under the administrative manager in a much larger facility and handle most all of the daily decisions. Assistants will help with direct activities set by the manager in all clinical areas, like nursing, also including surgery, therapy depts., medical records dept., or the health information dept. 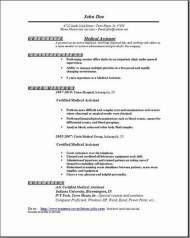 You can adapt any of the three medical administration resume formats above for any of these positions.